The Chinese calendar is lunisolar, incorporating elements of a lunar calendar with those of a solar calendar. It has been in continual use in China for almost 4000 years. The calendar was important in ancient China both as a guide for agricultural activities and because regularity in the yearly cycle was a sign of a well-governed empire whose ruler was supported by the Mandate of Heaven. Each year the emperor issued a calendar prepared by a board of astronomers. In the ancient Chinese lunar calendar, each month began on the day of a new moon, with an additional day added from time to time, to catch up with "drifts" between the calendar and the actual moon cycle, and intercalary months added in an arbitrary fashion, at the end of the year. Twenty-four seasonal markers called jiéqì (節氣), which follow the solar year, were inserted in the Chinese calendar to help farmers to decide when to plant or harvest crops. Each jiéqì was named for an event that occurred during that time period on the plains of northern China, such as “the awakening of insects.” A lunar year (年, nián) is from one Chinese new year to the next. A solar year (歲, suì) is either the period between one Spring Equinox and the next or the period between two winter solstices. A lunar year is exclusively used for dates, whereas a solar year, especially that between winter solstices, is used to number the months. After Jesuits introduced Western astronomy into China during the seventeenth century, a calendar based on the true motions of both the sun and moon, calculated with sinusoids, was published. The Republic of China officially adopted the Gregorian calendar for public purposes by beginning with January 1, 1929. In most of East Asia today, the Gregorian calendar is used for day-to-day activities, but the Chinese calendar is still used for marking traditional East Asian holidays such as the Chinese New Year (春节or “Spring Festival) and in China, the Duan Wu festival and the Mid-Autumn Festival. It is also used in astrology for choosing the most auspicious date for events such as a wedding or the opening of a building. The Babylonians devised the earliest lunisolar calendar after approximately 2500 B.C.E.) and the lunisolar calendar is not exclusive to China, but the lunisolar calendar is often referred to as the “Chinese calendar” because a fairly accurate version was perfected by the Chinese around 500 B.C.E. and because it remained in continual use in China until the present. In China, the traditional calendar is often referred to as "the Xia Calendar" (Traditional Chinese: 夏曆; Simplified Chinese: 夏历; pinyin: xiàlì), following a comment in the Shiji which states that under the Xia Dynasty, the year began on the second new moon after the winter solstice (under the time systems of some of the other dynasties in ancient China, the year occasionally began on the first or third new moon after winter solstice). It is also known as the "agricultural calendar" (Traditional Chinese: 農曆; Simplified Chinese: 农历; pinyin: nónglì) while the Gregorian calendar is known as the "common calendar" (Traditional Chinese: 公曆; Simplified Chinese: 公历; pinyin: gōnglì) or "Common calendar." Another name for the Chinese calendar is the "Yin Calendar" (Traditional Chinese: 陰曆; Simplified Chinese: 阴历; pinyin: yīnlì) in reference to the lunar aspect of the calendar, whereas the Gregorian calendar is the "Yang Calendar" (Traditional Chinese: 陽曆; Simplified Chinese: 阳历; pinyin: yánglì) in reference to its solar properties. The Chinese calendar was also called the "old calendar" (Traditional Chinese: 舊曆; Simplified Chinese: 旧历; pinyin: jiùlì) after the "new calendar" (Traditional Chinese: 新曆; Simplified Chinese: 新历; pinyin: xīnlì), i.e. the Gregorian calendar, was adopted as the official calendar. Since the time of Emperor Wu of Han, starting the new year on the second new moon after winter solstice remained the norm for more than two thousand years. According to Chinese tradition, some form of the Chinese calendar has been in use for almost five millennia. Based on archaeological evidence, some form of it has been in use for three and a half millennia. The calendar was important in ancient China because it was used by farmers to regulate their agricultural activities, and because regularity in the yearly cycle was a sign of a well-governed empire in which the ruler was able to maintain harmony between Heaven and Earth. The calendar prepared each year by the emperor’s astronomers was a symbol that an emperor’s rule was sanctioned by Heaven. According to Chinese legend, in 2254 B.C.E. the Emperor Yao ordered his astronomers to define the annual cycles of changing seasons, and during the Shang dynasty a calendar was prepared annually by a board of mathematicians under the direction of a minister of the imperial government. Each new Chinese dynasty published a new official annual calendar, and publication of an unofficial calendar could be regarded an act of treason. The earliest evidence of the Chinese calendar is found on oracle bones of the Shang Dynasty (late second millennium B.C.E. ), which seem to describe a lunisolar year of twelve months, with a possible intercalary thirteenth, or even fourteenth, added empirically to prevent calendar drift. The Sexagenary cycle for recording days was already in use. Tradition holds that, in that era, the year began on the first new moon after the winter solstice. Early Eastern Zhou texts, such as the Spring and Autumn Annals, provide better understanding of the calendars used in the Zhou dynasty (1045 – 256 B.C.E.). One year usually had 12 months, which were alternatively 29 and 30 days long (with an additional day added from time to time, to catch up with "drifts" between the calendar and the actual moon cycle), and intercalary months were added in an arbitrary fashion, at the end of the year. These arbitrary rules on day and month intercalation caused the calendars of each state to differ slightly at times. Thus, texts like the Annals will often state whether the calendar they use (the calendar of Lu) is in phase with the Royal calendar (used by the Zhou kings). Although tradition holds that in the Zhou Dynasty, the year began on the new moon which preceded the winter solstice, the Spring and Autumn Annals seem to indicate that (in Lu at least) the Yin calendar (the calendar used in Shang Dynasty, with years beginning on the first new moon after the winter solstice) was in use until the middle of the seventh century, and that the beginning of the year was shifted back one month around 650 B.C.E.. In 256 B.C.E., as the last Zhou king ceded his territory to Qin, a new calendar (the Qin calendar) began to be used. It followed the same principles as the Sifen calendar, except the year began one month before (the second new moon before the winter solstice, which now fell in the second month of the year). The Qin calendar was used during the Qin dynasty, and in the beginning of the Western Han dynasty. The Emperor Wu of the Western Han dynasty (206 B.C.E. – 9 C.E.) introduced reforms that have governed the Chinese calendar ever since. His Tàichū 太初 (Grand Inception) calendar of 104 B.C.E. had a year with the winter solstice in the eleventh month and designated as intercalary any calendar month (a month of 29 or 30 whole days) during which the sun does not pass a principal term (that is, remained within the same sign of the zodiac throughout). Because the sun's mean motion was used to calculate the jiéqì (Traditional Chinese: 節氣; Simplified Chinese: 节气) (or seasonal markings) until 1645, this intercalary month was equally likely to occur after any month of the year. The conjunction of the sun and moon (the astronomical new moon) was calculated using the mean motions of both the sun and moon until 619, the second year of the Tang Dynasty, when chronologists began to use true motions modeled using two offset opposing parabolas (with small linear and cubic components). Unfortunately, the parabolas did not meet smoothly at the mean motion, but met with a discontinuity or jump. The Taichu Calendar of 104 B.C.E. set the tropical year at 365 days and the lunar month at 29 days. 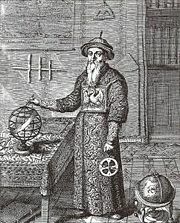 Western astronomy was introduced into China during the seventeenth century by the Jesuits. In 1611, the Chinese Ministry of Rites recommended that the calendar be reformed and the imperial government commissioned a group of Jesuits to serve in the Board of Astronomy. In the 1645 Shíxiàn calendar (時憲書, Book of the Conformity of Time) of the Qing dynasty (1644 – 1912), made by the Jesuit Adam Schall (1591 – 1666), the motions of both the sun and moon began to be calculated with sinusoids. The true motion of the sun was now used to calculate the jiéqì, which caused the intercalary month to often occur after the second through the ninth months, but rarely after the tenth through first months. A few autumn-winter periods have one or two calendar months where the sun enters two signs of the zodiac, interspersed with two or three calendar months where the sun stays within one sign. On January 1, 1912 the Gregorian calendar was adopted by the nascent Republic of China for official business, but the general populace continued to use the traditional calendar. The status of the Gregorian calendar was unclear between 1916 and 1921 while China was controlled by several competing warlords, each supported by foreign colonial powers. From about 1921 until 1928 warlords continued to fight over northern China, but the Kuomintang or Nationalist government controlled southern China and used the Gregorian calendar. After the Kuomintang reconstituted the Republic of China on October 10, 1928, the Gregorian calendar was officially adopted, beginning with 1 January, 1929. Along with this, the time zone for the whole country was adjusted to the coastal time zone that had been used in European treaty ports along the Chinese coast since 1904. 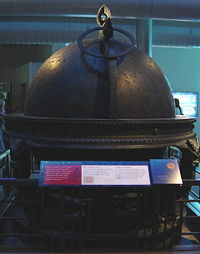 This changed the beginning of each calendar day, for both the traditional and Gregorian calendars, by plus 14 minutes and 26 seconds from Beijing midnight to midnight at the longitude 120° east of Greenwich. This caused some discrepancies, such as with the 1978 Mid-Autumn Festival. There was a new moon on September 3, 1978, at 00:07, China standard time. Using the old Beijing time zone, the New Moon occurred at 23:53 on the 2nd, so the eighth month began on a different day in the calendars. Thus people in Hong Kong (using the traditional calendar) celebrated the Festival on September 16, but those in the mainland celebrated on September 17. The following rules outline the Chinese calendar since c.104 B.C.E. Note that the rules allow either mean or true motions of the Sun and Moon to be used, depending on the historical period. If there are 12 months between two successive occurrences of month 11, at least one of these 12 months must be a month during which the sun remains within the same zodiac sign throughout (no principal term or cusp occurs within it). If only one such month occurs, it is designated intercalary, but if two such months occur, only the first is designated intercalary. The times of the astronomical new moons and the sun entering a zodiac sign are determined in the Chinese Time Zone by the Purple Mountain Observatory (紫金山天文台, Zǐjīnshān Tiānwéntái) outside Nanjing using modern astronomical equations. Chinese Americans use Nanjing Calendar instead of defining a local one. For them, the new moon can occur on the last day of the previous month according to their local USA time. For example, a new moon occurred on May 16, 2007 by USA time, but Chinese Americans still regard May 17, 2007 as the first day of a new month. Further, they define the boundaries of the day according to a USA local time zone. Thus rule number 1 is not followed in this case. The zodiac sign which the sun enters during the month and the ecliptic longitude of that entry point usually determine the number of a regular month. Month 1 (正月, zhēngyuè), literally means principal month. All other months are literally numbered, second month, third month, etc. Some believe the above correspondence to be always true, but there are exceptions, which, for example, prevent Chinese New Year from always being the second new moon after the winter solstice, or that cause the holiday to occur after the Rain Water jiéqì. An exception will occur in 2033-2034, when the winter solstice is the second solar term in the eleventh month. The next month is a no-entry month and so is intercalary, and a twelfth month follows which contains both the Aquarius and Pisces solar terms (deep cold and rain water). The Year of the Tiger thus begins on the third new moon following the winter solstice, and also occurs after the Pisces (rain water) jieqi, on February 19. Another occurrence was in 1984-1985, after the sun had entered both Capricorn at 270° and Aquarius at 300° in month 11, and then entered Pisces at 330° during the next month, which should have caused it to be month 1. The sun did not enter any sign during the next month. In order to keep the winter solstice in month 11, the month which should have been month 1 became month 12, and the month thereafter became month 1, causing Chinese New Year to occur on February 20, 1985 after the sun had already passed into Pisces at 330° during the previous month, rather than during the month beginning on that day. On those occasions when a dual-entry month does occur, it always occurs somewhere between two months that do not have any entry (non-entry months). It usually occurs alone and either includes the winter solstice or is nearby; placing the winter solstice in month 11 (rule 4) decides which of the two non-entry months becomes the intercalary month. In 1984-1985, the month immediately before the dual-entry month 11 was a non-entry month which was designated as an intercalary month 10. All months from the dual-entry month to the non-entry month that is not to be intercalary are sequentially numbered with the nearby regular months (rule 2). The last phrase of rule 5, choosing the first of two non-entry months between months 11, has not been required since the last calendar reform, and will not be necessary until the 2033-2034 occasion, when two dual-entry months will be interspersed among three non-entry months, two of which will be on one side of month 11. The leap eleventh month produced is a very rare occasion. Exceptions such as these are rare. Fully 96.6 percent of all months contain only one entry into a zodiacal sign (have one principal term or cusp), all obeying the numbering rules of the jiéqì table, and 3.0 percent of all months are intercalary months (always non-entry months between principal terms or cusps). Only 0.4 percent of all months either are dual-entry months (have two principal terms or cusps) or are neighboring months that are renumbered. This situation only arose after the 1645 reform, when it became necessary to fix one month to always contain its principal term and allow any other to occasionally not contain its principal term. Month 11 was chosen, because its principal term (the winter solstice) forms the start of the Chinese Solar year (the sui). The Chinese lunar calendar and the Gregorian Calendar often synchronize every 19 years (Metonic cycle). Most Chinese people notice that their Chinese and Western birthdays fall on the same day on their 19th and 38th birthdays and so on. However, a 19-year cycle with a certain set of intercalary months is only an approximation, so an almost identical pattern of intercalary months in subsequent cycles will eventually change after some multiple of 19 years to a quite different 19-year cycle. The Chinese zodiac (see Nomenclature and Twelve Animals sections) is only used in naming years—it is not used in the actual calculation of the calendar. In fact, the Chinese have a very different constellation system. Primens (first month) 正月: Latin "]]primus mensis.]]" Apricomens (apricot month) 杏月: apricot blossoms. Peacimens (peach month) 桃月: peach blossoms. Plumens (plum month) 梅月: plum ripens. Guavamens (guava month) 榴月: pomegranate blossoms. Lotumens (lotus month) 荷月: lotus blossoms. Orchimens (orchid month) 蘭月: orchid blossoms. Osmanthumens (osmanthus month) 桂月: osmanthus blossoms. Chrysanthemens (chrysanthemum month) 菊月: chrysanthemum blossoms. Benimens (good month) 良月: good month. Hiemens (hiemal month) 冬月: hiemal month. Lamens (last month) 臘月: last month. Traditional Chinese years were not continuously numbered in the way that the B.C.E./C.E. system is. Commonly, years were officially counted from the start of the reign of particular king or emperor (regnal year). This system began in 841 B.C.E. during the Zhou Dynasty. Prior to this, years were not marked at all, and historical events cannot be dated exactly. In 841 B.C.E., the Li King Hu of Zhou (周厲王胡) was ousted by a civilian uprising (國人暴動), and the country was governed for the next 14 years by a council of senior ministers, a period known as the Regency (共和行政). In this period, years were marked as First (second, third, etc.) Year of the Regency. Subsequently, years were marked as regnal years; for example, the year 825 B.C.E. was marked as the 3rd Year of the Xuan King Jing of Zhou (周宣王三年). This system was used until early in the Han Dynasty, when the Wen Emperor of Han (漢文帝劉恒) instituted regnal names. After this, most emperors used one or more regnal names to mark their reign. An emperor would institute a new name upon accession to the throne, and then change to new names to mark significant events, or to end a perceived cycle of bad luck. During the Ming Dynasty, however, each emperor typically used only one regnal name for his reign. During the Qing dynasty, each emperor used only one regnal name for his reign. This system continued until the Republic of China, which counted years as Years of the Republic, beginning in 1912. Thus, 1912 is the 1st Year of the Republic, and 1949 the 38th. This system is still used for official purposes in Taiwan. For the rest of China, in 1949 the People's Republic of China chose to use the Common Era system (equivalently, B.C.E./C.E. system), in line with international standards. The other system by which years are marked historically in China is the stem-branch or sexagenary cycle. This system is based on two forms of counting: a cycle of ten Heavenly Stems and a cycle of 12 Earthly Branches. Each year is named by a pair of one stem and one branch called a Stem-Branch (干支, gānzhī). The Heavenly Stems are associated with Yin Yang and the Five Elements. Recent 10-year periods began in 1984, 1994, and 2004. The Earthly Branches are associated with the 12 signs of the Zodiac. Each Earthly Branch is also associated with an animal, collectively known as the Twelve Animals. Recent 12-year periods began in 1984, 1996 and 2008. At first, this system was used to mark days, not years. The earliest evidence of this was found on oracle bones from the Shang Dynasty dated c.1350 B.C.E. This system of date marking continues to this day, and can still be found on Chinese calendars. Although a stem-branch cannot be used to deduce the actual day of a historical event, it can assist in converting Chinese dates to other calendars more accurately. The months and hours can also be denoted using Heavenly Stems and Earthly Branches, though they are commonly addressed using Chinese numerals instead. In Chinese astrology, four Stem-Branch pairs form the Eight Characters (八字, bāzì). There is no universally agreed upon "epoch" or starting point for the Chinese calendar. Tradition holds that the calendar was invented by Emperor Huang-di (黄帝) in the 61st year of his reign in what is now known under the proleptic Gregorian calendar as 2637 B.C.E. Many have used this date as the epoch, the first year of the first 60-year (sexagesimal) cycle, of the Chinese calendar, but others have used the date of the beginning of his reign in 2697 B.C.E. as the epoch. Since these dates are exactly 60 years apart, it does not matter which is used to determine the stem/branch sequence or the astrological sign for any succeeding year. That is, 2006 is a bingxu year and the "Year of the Dog" regardless of whether years are counted from 2637 B.C.E. or 2697 B.C.E.. The imposition of a continuous numbering system on the Chinese calendar was of interest mostly to Jesuit missionaries and other Westerners who assumed that calendars obviously had to be continuous. In the early twentieth century, as part of a campaign to delegitimize the Qing Dynasty, some Chinese Republicans began to advocate widespread use of continuously numbered years, so that year markings would be independent of the Emperor's regnal name. When Sun Yat-sen became the provisional president of the Republic of China, he sent telegrams to leaders of all provinces and announced the 13th day of 11th Month of the 4609th year of the Yellow Emperor's reign (corresponding to January 1st, 1912) to be the 1st year of the Republic of China. His choice was adopted by many overseas Chinese communities outside Southeast Asia such as San Francisco's Chinatown. 2 As discussed above, there is considerable difficulty in establishing a basis for the chronology of the continuous year numbers. The numbers listed here are too high by 60 if an epoch of 2637 B.C.E. is accepted. They may be too low by 1 if an epoch of 2698 B.C.E. is accepted. That is, according to some sources, Gregorian 2006 (Chinese 4703) could alternatively correspond to 4643, or perhaps 4704. Chinese Americans in the United States use the epoch of 2698 B.C.E. as the basis for numbering the years, and therefore Gregorian 2006 is numbered as 4704 and so forth for previous and subsequent years. 3 The correspondence between a lunisolar Chinese year and a solar Gregorian year is of course not exact. The first few months of each Gregorian year—those preceding Chinese New Year—belong to the previous Chinese year. For example, January 1 – January 28, 2006 belongs to yǐyǒu or 4702. It might be more precise to state that Gregorian 2006 corresponds to 4702–4703, or that continuous Chinese 4703 corresponds to 2006–2007. There is a distinction between a solar year and a lunar year in the Chinese calendar because the calendar is lunisolar. A lunar year (年, nián) is from one Chinese new year to the next. A solar year (歲, suì) is either the period between one Spring Equinox and the next or the period between two winter solstices (see Jiéqì section). A lunar year is exclusively used for dates, whereas a solar year, especially that between winter solstices, is used to number the months. Under the traditional system of hour-marking, each day is divided into 12 units (時辰). Each of these units is equivalent to two hours of international time. Each is named after one of the twelve Earthly Branches. The first unit, Hour of Zi (子時), begins at 11 P.M. of the previous day and ends at 1 A.M. Traditionally, executions of condemned prisoners occur at the midpoint of Hour of Wu (正午時), i.e., noon. A second system subdivided the day into 100 equal parts, ke, each of which equaled 14.4 minutes or a familiar rough quarter of a standard Western hour. This was valid for centuries, making the Chinese first to apply decimal time. However, because 100 could not be divided equally into the 12 "hours," the system was changed to variously 96, 108, or 120 ke in a day. During the Qing Dynasty, the number was officially settled at 96, making each ke exactly a quarter of a Western hour. Today, ke is often used to refer to a quarter of an hour. 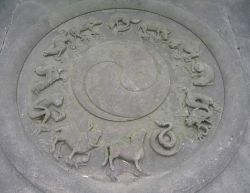 Stone carving of Chinese zodiac. Yin-yang and animals of the Chinese zodiac. Qingyanggong temple, Chengdu, Sichuan, China. The Twelve animals (十二生肖 shí'èr shēngxiào, "twelve birth emblems" or colloquially 十二屬相 shí'èr shǔxiàng, "twelve signs of belonging") representing the twelve Earthly Branches are, in order, the rat, ox, tiger, rabbit, dragon, snake, horse, sheep (or goat), monkey, rooster, dog, and pig (or boar). A legend explains the sequence in which the animals were assigned. Supposedly, the twelve animals fought over the precedence of the animals in the cycle of years in the calendar, so the Chinese gods held a contest to determine the order. All the animals lined up on the bank of a river and were given the task of getting to the opposite shore. Their order in the calendar would be set by the order in which the animals managed to reach the other side. The cat wondered how he would get across if he was afraid of water. At the same time, the ox wondered how he would cross with his poor eyesight. The calculating rat suggested that he and the cat jump onto the ox's back and guide him across. The ox was steady and hard-working so that he did not notice a commotion on his back. In the meanwhile, the rat sneaked up behind the unsuspecting cat and shoved him into the water. Just as the ox came ashore, the rat jumped off and finished the race first. The lazy pig came to the far shore in twelfth place. And so the rat got the first year named after him, the ox got the second year, and the pig ended up as the last year in the cycle. The cat finished too late to win any place in the calendar, and vowed to be the enemy of the rat forevermore. The term Jiéqì is usually translated as "Solar Terms" (Nodes of Weather). Each node is the instant when the sun reaches one of 24 equally spaced points along the ecliptic, including the solstices and equinoxes, positioned at 15 degree intervals. Because the calculation is solar-based, these jiéqì fall around the same date every year in solar calendars (e.g. the Gregorian Calendar), but do not form any obvious pattern in the Chinese calendar. The dates below are approximate and may vary slightly from year to year due to the intercalary rules (system of leap years) of the Gregorian calendar. Jiéqì are published each year in farmers' almanacs. Chinese New Year is usually the new moon closest to lìchūn. In the table below, these measures are given in the standard astronomical convention of ecliptic longitude, zero degrees being positioned at the vernal equinox point. Each calendar month under the heading "M" contains the designated jiéqì called a principal term, which is an entry into a sign of the zodiac, also known as a cusp. Here term has the archaic meaning of a limit, not a duration. In Chinese astronomy, seasons are centered on the solstices and equinoxes, whereas in the standard Western definition, they begin at the solstices and equinoxes. Thus the term Beginning of Spring and the related Spring Festival fall in February, when it is still very chilly in temperate latitudes in the Northern Hemisphere. The Chinese calendar year has nine main festivals, seven determined by the lunisolar calendar, and two derived from the solar agricultural calendar. (Farmers actually used a solar calendar, and its 24 terms, to determine when to plant crops, due to the inaccuracy of the lunisolar traditional calendar. However, the traditional calendar has also come to be known as the “agricultural calendar.”) The two special holidays are the Qingming Festival and the Winter Solstice Festival, falling upon the respective solar terms, at ecliptic longitudes of 15° and 270°, respectively. All other calendrical calculations use civil time in China, UTC+8. Most people, upon using or studying the Chinese calendar, are perplexed by the intercalary month because of its seemingly unpredictable nature. As mentioned above, the intercalary month refers to additional months added to the calendar in some years to correct for its deviation from the astronomical year, a function similar to that of the extra day in February in leap years. The complex astronomical knowledge required to calculate if and when an intercalary month needs to be inserted makes it a mystery to most people. This has led to a superstition that intercalary months in certain times of the year bring bad luck. The main purpose of the intercalary month is to correct for deviations of the calendrical year from the astronomical year. Because the Chinese calendar is mainly a lunar calendar, its standard year is 354 days, whereas the astronomical year is approximately 365¼ days. Without the intercalary month, this deviation would build up over time, and the Spring festival, for example, would no longer fall in Spring. Thus, the intercalary month serves a valuable purpose in ensuring that the year in the Chinese calendar remains approximately in line with the astronomical year. The intercalary month is inserted whenever the Chinese calendar moves too far from the stage of progression of the Earth in its orbit. Thus, for example, if the beginning of a certain month in the Chinese calendar deviates by a certain number of days from its equivalent in a solar calendar, an intercalary month needs to be inserted. The practical benefit of this system is that the calendar is able to synchronize approximately with the solar cycle, while at the same time retaining months that roughly correspond with lunar cycles. This is the reason for the term lunisolar calendar. The lunisolar calendar is important because many traditional festivals correspond to significant events in the moon's cycle. For example, the mid-autumn festival is always on a day of the full moon. In recent years, some Chinese scholars have called for calendar reform because of the increasing irrelevance of the Chinese calendar in modern life and cite the example of Japan, which adopted the Gregorian calendar during the Meiji Restoration and simply shifted all traditional festivities onto an equivalent date. However, the Chinese calendar remains important as an element of cultural tradition, and for certain cultural activities. While the traditional calendar could be removed without much practical effect, its sentimental and cultural significance ensures that it will remain in use, at least for the near future. The original practical relevance of the lunisolar calendar for date marking has largely disappeared. The Gregorian calendar is much easier to compute and more in accord with both international standards and the astronomical year. Its adoption for official purposes has meant that the traditional calendar is rarely used for date marking. It is more convenient to remember significant events such as birth dates by the Gregorian rather than the Chinese calendar. The 24 solar terms (including the solstices and equinoxes), which were important for farmers planning their agricultural activities, are more predictable by the Gregorian calendar than by the lunisolar calendar since they are based on the solar cycle. It is easier for the average Chinese farmer to organize planting and harvesting using the Gregorian calendar. In most of East Asia today, the Gregorian calendar is used for day-to-day activities, but the Chinese calendar is still used for marking traditional East Asian holidays such as the Chinese New Year (春节or “Spring Festival,” not to be confused with Lunar New Year, which is the beginning for several lunisolar calendars), and in China, the Duan Wu festival and the Mid-Autumn Festival. Because each month follows one cycle of the moon, it is also used to determine the phases of the moon. The traditional Chinese calendar remains culturally essential; for example, most of the traditional festivals, such as Chinese New Year and the Mid-Autumn Festival, traditionally occur at new moon or full moon. As an element of traditional culture, it is imbued with cultural and nationalistic significance. The Chinese calendar is still used in traditional Chinese households around the world to pick 'lucky dates' for important events such as weddings, funerals, and business deals. A special calendar called Huang Li (Traditional Chinese: 皇曆; Simplified Chinese: 皇历; pinyin: huánglì, "Imperial Calendar"), which contains auspicious activities, times, and directions for each day, is used for this purpose. The calendar follows the Gregorian dates but has the corresponding Chinese dates. Every date has a comprehensive listing of astrological measurements and fortune elements. The T’ung Shu (Tong Shu), an agricultural almanac in use for more than 4000 years, is still published annually and consulted by Chinese all over the world. The front of the almanac always has an illustration of a farmer with an ox, with details of the drawing, such as the farmer’s clothing, indicating the weather predicted for that year. Other traditional East Asian calendars are very similar, if not identical, to the Chinese calendar: the Korean calendar is identical; the Vietnamese calendar substitutes the cat for the rabbit in the Chinese zodiac; the Tibetan calendar differs slightly in animal names, and the traditional Japanese calendar uses a different method of calculation, resulting in disagreements between the calendars in some years. The 12-year cycle, with the animal names translated into the vernacular, was adopted by the Göktürks (its use there is first attested 584), and spread subsequently among many Turkic peoples, as well as the Mongols. A similar calendar seems to have been used by the Bulgars, as attested in the Nominalia of the Bulgarian Khans and in some other documents. In 1258, when both North China and the Islamic world were part of the Mongol Empire, Hulagu Khan established an observatory in Maragheh for the astronomer Nasir al-Din al-Tusi at which a few Chinese astronomers were present, resulting in the Chinese-Uighur calendar that al-Tusi describes in his Zij-i Ilkhani. The 12-year cycle, including Turkish/Mongolian translations of the animal names (known as sanawat-e turki, سنوات ترکی,) remained in use for chronology, historiography, and for bureaucratic purposes in the Persian and Turkish speaking world from Asia Minor to India throughout the Medieval and Early Modern periods. In Iran it remained common in agricultural records and tax assessments until a 1925 law deprecated its use. ↑ 1.0 1.1 Scott Petullo & Stephen Petullo, Calendars, Time, & Numerology. Retrieved January 29, 2017. ↑ 2.0 2.1 2.2 2.3 Dorothy Perkins, “Chinese Calendar.” Encyclopedia of China: the essential reference to China, its history and culture (New York: Facts on File, 1999), 51 -52. ↑ 3.0 3.1 Yingke Deng, Ancient Chinese Inventions, Translated by Wang Pingxing (Beijing: China Intercontinental Press (五洲传播出版社). 2005. ISBN 7508508378), 67. ↑ Helmer Aslaksen, "The Mathematics of the Chinese Calendar" Department of Mathematics, National University of Singapore, 18 Retrieved January 29, 2017. ↑ See Helmer Aslaksen, The Mathematics of the Chinese Calendar for details. Retrieved January 29, 2017. ↑ The Mid-Autumn Festival is called the Lantern Festival in Singapore and Malaysia, the same name given to as another festival on month 1 day 15 in the Chinese homeland. ↑ Benno van Dalen, E.S. Kennedy, Mustafa K. Saiyid. The Chinese-Uighur Calendar in Tusi's Zij-i Ilkhani. (Zeitschrift für Geschichte der Arabisch-Islamischen Wissenschaften 11. 1997), 111-151. Crump, Stephen. Chinese calendar. Kogarah, N.S.W. : Pub. for the Australian-China Society (N.S.W. Branch), 1978. Harvey, O. L. The Chinese calendar. Silver Spring, MD: Harvey, 1986. Tin, Veronica Chin Hei, and Helmer Aslaksen. The mathematics of the Chinese calendar. Singapore: National University of Singapore, 1999.
van Dalen, Benno; E.S. Kennedy, Mustafa K. Saiyid. «The Chinese-Uighur Calendar in Tusi's Zij-i Ilkhani», 111-151. in Zeitschrift für Geschichte der Arabisch-Islamischen Wissenschaften 11. 1997. All links retrieved January 29, 2017. This page was last modified on 29 January 2017, at 23:06.